What’s All the Hype With Bunk Sandwiches? You are here: Home / Lunch / What’s All the Hype With Bunk Sandwiches? 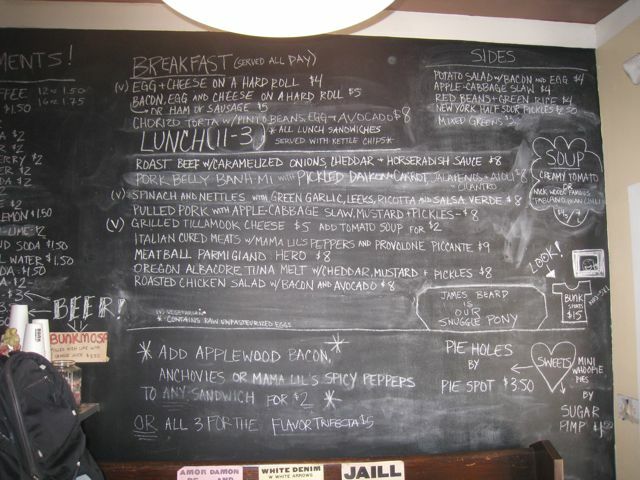 Menu at Bunk Sandwiches. It changes with what's in season. Bunk Sandwiches has been written up many times. This place is a local sandwich shop that draws a big crowd and with that a big line. The place is small, so if you are coming expecting to eat in, come early because the tables go quickly. If it’s sunny then grab it to go and find some place less hectic. Bunk has been on my list for quite some time. You read about it and you have seen it on TLC’s Dine In, Diners and Drives. If you haven’t heard about it… never mind I can’t imagine anyone hasn’t heard about it. Finally the time came to make my way down and check out the eats. I went with 2 of my foodie friends and we decided on the way down to get 3 different things. We are all food sharers, so it works out amazingly well. This place is a little whole in the wall. I was still gazing at the Tattoo shop when I noticed it was right there. I was expecting something a little bigger. But I like the the little places. To me it means they aren’t cranking out large amounts of food that need to be pre made ahead of time. Instead they make it as you order. Between the 3 of us we ordered the Chicken Salad Sandwich with bacon and avocado, the Pulled Pork Sandwich, and the Spinach and Nettles sandwich. 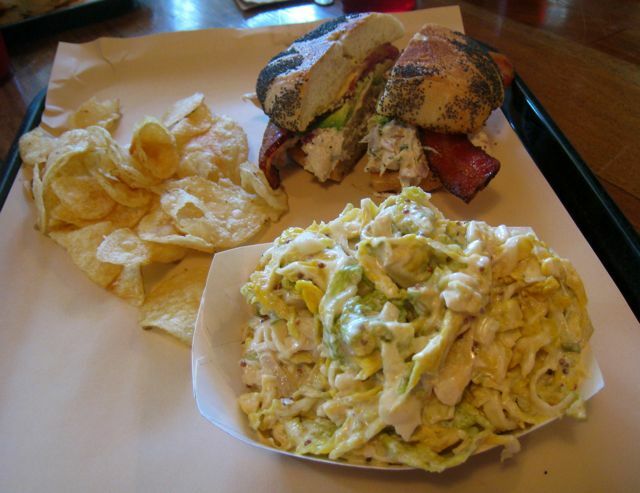 Each sandwich comes with Kettle chips, but we didn’t stop there, we also go one side of the coleslaw and a Pie Hole. One of the girls had been there before and a sandwich that she had was no longer on the menu. I like places that change things up, unless of course it’s something I liked and then it’s gone. I had the Chicken sandwich. It was good, but not incredibly special. I wish I could say more, but I have nothing more to say. The pulled pork sandwich was not at all what any of us expected. There is no BBQ flavor to it, so that was disappointing to the girls, but I liked it because I am not a huge BBQ fan. It was sweet and juicy and topped with apple slaw. The Spinach and Nettles sandwich sounded really good to me, but then after really checking it out I decided against it. Yet the gal taking our order told us we needed to try it. I have to say it ended up being the best sandwich. All of us liked it better than our own. Even though it sounds weird, it’s a must try. Here is my opinion of Bunk Sandwiches and the hype. It’s a local joint that does what it does well. They have made a name for themselves because they are using fresh local ingredients. You can tell that by the every changing menu and the Nettles sandwich.For those of us that aren’t local, it might not be worth the trip down. It’s not bad by any means, it’s just another great sandwich shop. Atmosphere is a hole in the wall, small shop with a few tables inside and even fewer outside. Prices are good at $8 for sandwich and chips. For drinks they served Boylans sodas. I have no idea what that is, but they had a huge selection of it and many people love that they carry this brand. 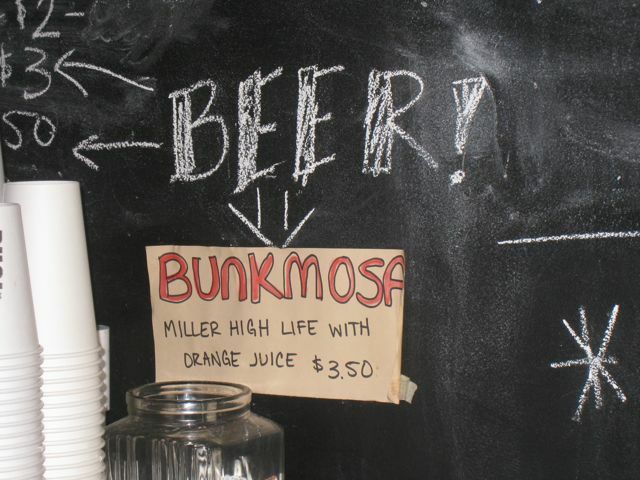 They have a limited beer selection, but you can order the Beer Mosa, which is there “specialty.” They also serve Stumptown Coffee. Um I haven’t heard of Bunktown sandwiches. What was the pie hole? I like pie. The pie hole is just a small piece of pie, like a muffin tin size. We got the Pecan pie and it was not great. I am not a lover of pecan pie, but the other girls were and they both said it was just ok. Interesting concept. Sounds like it has the potential to be good.